We got some great questions to go over today! I’d like to ask how you got started with milking goats and how much daily work they really need. We had been thinking for quite awhile about getting goats but at first we didn’t think we had the space to keep them. 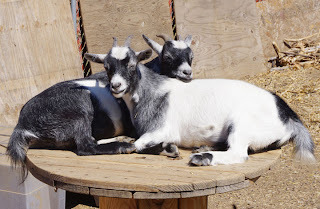 We were then introduced to Kitty from Havenscourt Homestead in Oakland, who was raising 4 goats (she has 5 plus 3 kids right now) on her 4,000 sf lot. She gave us a consultation on goats and we quickly realized that they were totally feasible for us. In February of 2010 we got our first two does. In October we felt it was time to breed them, so we “rented” a buck from one of Tom’s friends who raised the same breed. We kept him at our house for about 40 days to make sure that our girls were pregnant. Bella got pregnant 3 weeks before Daisy, which was nice because it gave us some breathing room between kiddings. Bella kidded in late March and Daisy kidded in early April. For the first two weeks after kidding we let the kids have all the milk. This is not only to get them stronger faster, but also the milk during those first two weeks still has colostrum in it which isn’t particularly appetizing. Some people take the kids away and bottle feed them but because we work full time, this wasn’t feasible. Before we even bred them, we started working with them on the stanchion- which is a milking stand – to get them used to it and used to us touching their teats and udders. It took some time, but now they are dolls (for the most part) while getting milked. As for daily work, it depends on how much you want to play with them. Since we still have the kids we only milk once a day, but once they are gone we’ll be milking them twice a day. Milking usually takes about 15 minutes and it needs to be done at 12 hour intervals. Feeding and watering are daily, of course, and we give them dairy pellet twice a day. It’s good to spend a little bit of time observing them each day to make sure everyone is healthy. Other than that, it’s not a huge block of time. As long as you have at least two, they are happy. Do you have gopher problems? I lost a lot of plants to gopher problems and I would love to hear solutions people have. We currently don’t have gophers (knock on wood) but at our previous house they were a concern. Chicken wire with the smaller cells and hardware cloth (wire mesh) are your best defenses. For young trees you want to create a basket that’s twice as wide and deep as the rootball to plant the tree in. For vegetable beds your best bet is raised beds with the chicken wire or hardware cloth between the ground and the bed. Of course, after several years, the wire will need to be replaced because it will rust and won’t be able to protect against the determined little buggers. 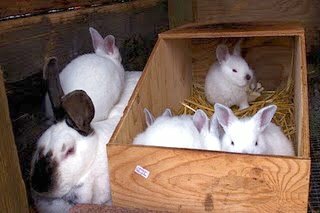 How long do you keep the baby rabbits in with the mother before moving them out to their own cage. 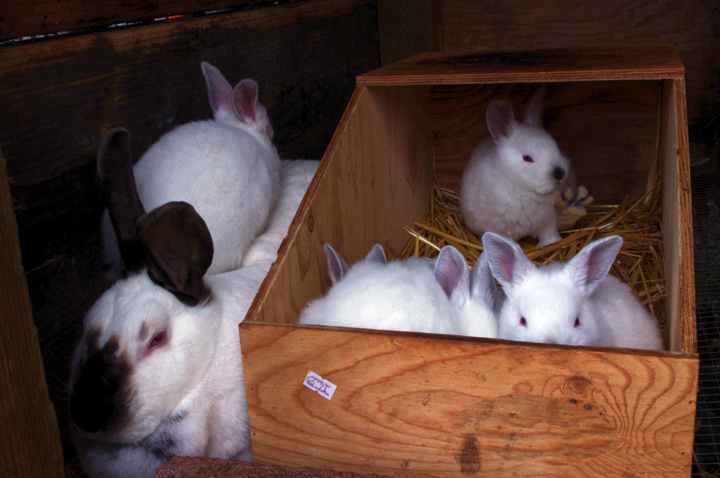 Also do you buy feed for the rabbits or grow your own? If we’re planning on breeding again we generally start removing them at 6 weeks old. We only remove one at a time (males first starting with the largest) to help our doe dry up her milk slowly so it’s less uncomfortable for her. If we don’t plan to breed right away we’ll only remove the males at 7 weeks old and leave her daughters in with her until they get too big and they need their own space. We both buy and feed them what we’ve grown. If you want to feed them forage just make sure they get the proper nutrition so they grow up healthy and strong. I will have to try the gum. Up here many old timers told us to use human hair. You can get it at the barber shop, save your own from cutting, etc. You just put some in each hole and the gophers go away. It seemed to work for us just with a couple emptyings of my hair brush.